Published by Mountainblog on 02/22/2017 . ISPO 2017, Murray Macadam (Marketing Associate) presents the Shakedry™ Product Technology by GORE-TEX®. Published by Mountainblog on 12/14/2016 . W.L. Gore & Associates (Gore) introduces GORE-TEX® road running shoes that fit and feel like regular road running shoes. From autumn and winter in 2017, runners can enjoy the benefit of breathability, water and cold protection yet with the fit and feel of non-protective running shoes. With GORE® Invisible Fit™ Technology, the GORE-TEX® membrane is engineered to bond to a variety of athletic uppers, keeping feet dry and comfortable in the foulest of running conditions; all backed-up with Gore’s GUARANTEED TO KEEP YOU DRY™ Promise. The first GORE-TEX® running shoes with GORE® Invisible Fit™ technology made by Saucony and Inov-8 will be available at retail from autumn/winter 2017. Published by Mountainblog on 07/26/2016 . At OutDoor 2016, Bernhard J. Kiehl (Fabrics Division Sustainability) explains how GORE-TEX® intends to offer non PFC Based DWR products by AW 2018.19. Published by Mountainblog on 03/09/2016 . The GORE-TEX® brand ambassador programme is a guarantor of success: as the recipient of several prestigious awards, the BIG DAYS programme goes into its fourth consecutive year in 2016 using the slogan “Big Days: Small Feet – Big Steps”. Prospective GORE-TEX® BIG DAYS brand ambassador families have the chance to apply for the program at http://bigdays.gore-tex.co.uk/ from 14th March 2016. Below the GORE-TEX® brand treats you to a sneak preview of the latest collections for spring and summer 2016 of Gore brand partners Primigi and Superfit. Most parents are well aware that their children experience new adventures every day – some with an immediate effect on their young lives: their first steps, their first holiday, their first day at school, their first football match, the first time they dance on stage. These special moments should not only be captured on film, they should also be cherished together with footwear that keeps your children’s feet dry and comfortable whatever they’re up to. The GORE-TEX® BIG DAYS brand ambassador programme combines both of these elements. It captures those memorable moments and promotes the theme of healthy foot development. Using the slogan “BIG DAYS: Small Feet – Big Steps”, for the fourth consecutive year the GORE-TEX® brand is looking for 25 brand ambassador families to comment online about their little heroes’ BIG DAYS throughout 2016. Each child in these families will be given two pairs of functional shoes from the latest collections of selected Gore brand partners to be tried and tested. All the blogs about their experiences and the styles they are wearing are published online at http://bigdays.gore-tex.co.uk/, the Internet platform focussing on children’s feet and foot health. This spring the GORE-TEX® brand ambassador families can look forward to a very special new technology: they are being given shoes with integrated GORE-TEX® SURROUND™ product technology that not only delivers total waterproofness but also outstanding breathability. This technology revolves around its open sole structure. The structure ensures that excess heat and sweat can escape outwards while water cannot penetrate into the shoe. The latest GORE-TEX® footwear collections from brand partners Primigi and Superfit are proof of the fact that functional footwear can also be trendy. These styles feature an innovative technology teamed up with a fashionable design. Primigi’s Ailen GTX® SURROUNDTM is quite the highlight for young fashion victims. Pastel tones juxtaposed with a floral design and shiny sequins let you rediscover the joys of spring. Through its open sole structure, the integrated GORE-TEX® SURROUNDTM product technology delivers maximum all-round breathability, even on warmer days. 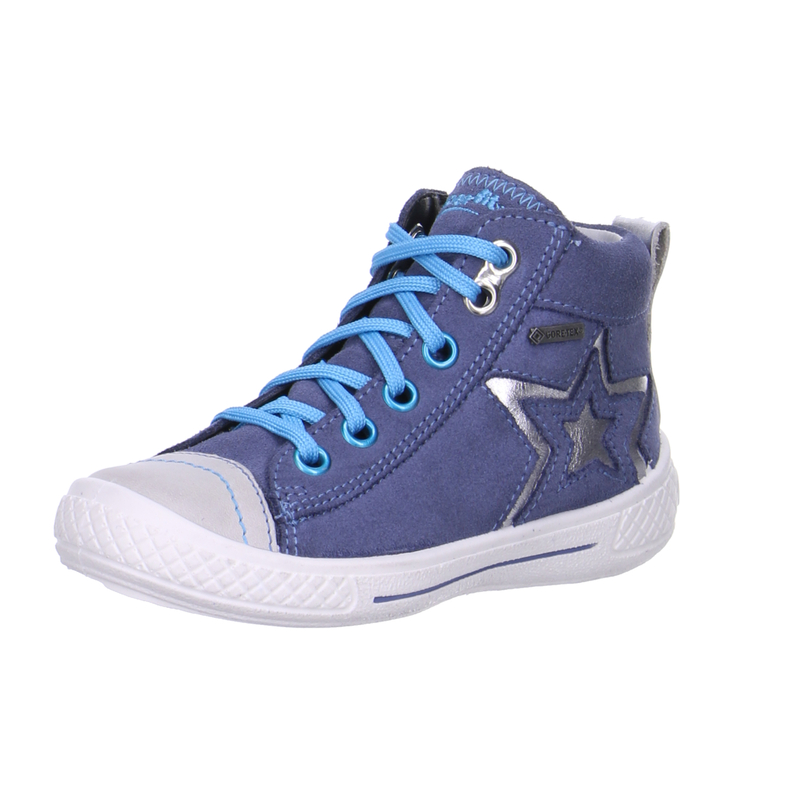 Superfit’s Tensy GTX® SURROUNDTM is no less striking: this snazzy sneaker makes an impression with bright blues, stylish velours leather and distinctive, silver metallic design elements. It looks great with blue jeans. Published by Mountainblog on 01/21/2016 . L. Gore & Associates (Gore) continues its scientific research and has published Life Cycle Assessment (LCA) data focusing on durable water repellent treatment (DWR) for functional outerwear. This is the third LCA that Gore has published since 2013. It was conducted with input from third party experts – including the Institute for Environmental Research, Vashon Island, Washington, USA. LCA is the global standard for assessing the total environmental impact of a finished product and takes into account all aspects of a product’s ecological footprint including resource and energy consumption, emissions to air, water and land, as well as health & ecosystems, and more. Gore Fabrics has been using LCAs since 1992. Gore conducted this LCA study to help guide future choices of DWR technologies. The study compared the environmental impacts, such as potential toxicity measured in equivalents of 1,4-Dichlorobenzene (kg DCB eq. ), of different DWR technologies: a non-fluorinated DWR (hydrocarbon based) and a short-chain polymer DWR currently used by Gore. 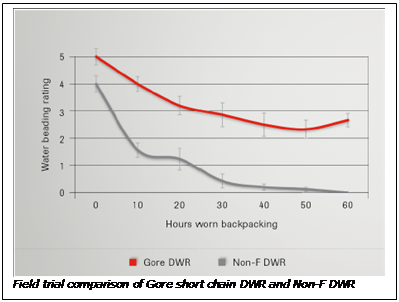 The assessment of GORE-TEX® jackets, with different DWR treatments, in backpacking and high aerobic activities showed that the currently available non-fluorinated DWR offering does not offer a better environmental profile than Gore’s current fluorocarbon based DWR treatment. The study revealed that the lower performance of non-fluorinated DWR treatments is the single biggest driver for the jacket’s environmental impact. The reason: In an attempt to maintain a satisfactory level of water repellency backpackers would have to wash and re-apply DWR treatments more frequently on garments with non-fluorinated DWR’s compared with Gore’s current short-chain polymer DWR. A well functioning DWR treatment is crucial to prevent the jacket from saturating with water, which increases weight and discomfort and could lead to reduced concentration and individual performance. Life Cycle Assessment (LCA) is a global standardized tool (DIN EN ISO 14040) to measure the environmental footprint of a finished product. LCA assesses the whole process with a “cradle to grave” approach – from raw material extraction through materials processing, manufacture, distribution, use, repair and maintenance to disposal or recycling. Published by Mountainblog on 10/23/2015 . W. L. Gore & Associates (Gore), the company behind the GORE‑TEX® and WINDSTOPPER® brands has been influencing the outdoor market with ground-breaking discoveries and technologies for more than 40 years. Gore is now restructuring its brands for autumn 2016. 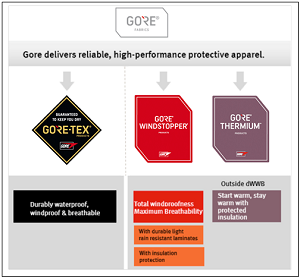 The new brand architecture was developed to help consumers distinguish between the product benefits of “durably waterproof and breathable” GORE-TEX® products – and “total windproof and maximum breathable” new GORE® WINDSTOPPER® and upcoming GORE® THERMIUM™ products. The new brand names will also make it easier for consumers to choose their ideal weather protective clothing. Future affiliated brands will therefore benefit from the strength of GORE®’s driving force – as it will be featured throughout the new and restructured brand architecture. Published by Mountainblog on 10/22/2015 . Known for its innovative culture and innovative products, W. L. Gore & Associates ranks among the world’s best companies to work for. Gore earned the number three spot on the Great Place to Work® Institute’s list of Best Multinational Workplaces, released last week. The ranking is the world’s largest annual study of workplace excellence and identifies the 25 best multinational companies in terms of workplace culture. For more than 50 years, Gore has cultivated a non-hierarchical corporate culture that fosters the innovative spirit of individuals and teams. Published by Mountainblog on 03/25/2015 . Walking is the joint most popular form of activity for adults in England, with 9.1 million people or 22% of the population regularly participating. In Wales and Scotland, the figures are even higher, with over 30% of adults enjoying a regular walk in the outdoors (1). Published by Mountainblog on 03/20/2015 . The success story continues: leading outdoor magazines in Europe and the USA and leading international trade fairs for the outdoor and sports industry award the innovative GORE-TEX® SURROUND™ product technology with numerous prizes. The first technology worldwide for durably waterproof hiking shoes that offer all-round breathability has already received a number of awards – these footwear models will be available in stores from the spring. Published by Mountainblog on 03/09/2015 . ISPO 2015, Kip Sturgill (Product Global Specialist Gloves and Accessories) presents the new GORE-TEX® Gloves + Gore Warm Technology. The origin of waterproof and breathable GORE-TEX® outerwear, footwear, and gloves starts with five little letters: ePTFE. ePTFE, or expanded polytetrafluoroethylene, was created by Bob Gore in 1969 when he rapidly stretched PTFE under certain conditions. The result was an incredibly strong, microporous material with an amazing list of characteristics including low water adsorption and good weathering properties. By 1978, GORE-TEX® fabric was introduced and the world met the first truly waterproof, breathable outerwear. Thanks to our commitment to innovation and creativity, waterproof and breathable GORE-TEX® products have continued to improve and evolve to keep in step with the changing needs of our customers.